Kid’s parties are fun filled little affairs but are cherished long after when the kid has turned big but reminisces the moments dearly still. These events are solely meant for the kids and hence everything should be organized keeping them in mind and should be done in a way that the kids have an absolute gala time with full dose of fun. There are a lot of ways of ensuring that kids have fun in their parties. Planning a party game for kids birthday parties in Melbourne or organizing a themed party or hiring a professional party entertainer is one of the options to gift your child with that delightful smile. When it comes to hiring a party entertainer for kids birthday parties in Melbourne, Balloonatic Bruce is the one to go with. 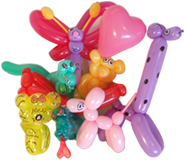 Being a professional balloon magician and balloon modeler based on Melbourne he is the quality entertainer for kids and elders alike. He is the master of his craft of balloon modeling and balloon twisting and is a class apart among his peers. But it’s not just his excellence in his craft that makes him appealing and a great entertainer; it’s his camaraderie with children of all ages that makes him one of the best in his business. He engages and mixes with the kids and becomes one of them .He brings with him a bundle of joy and happiness in the form of balloons and the children, along with the elders, adore him for it. He adds the color and fun to the kids birthday parties in Melbourne and enthralls audiences young and old alike.